I’ve said it before and I’ll say it again — the only business magazine worth reading is The Economist. 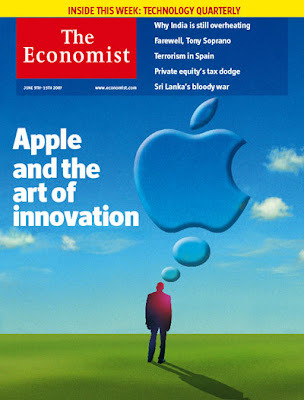 Once again they’ve struck gold with this cover article telling companies what they can learn about innovation from paying attention to Apple. Sure, they mention that “the not-always-lovable Mr Jobs is still stuck in a greedy-looking share-option “backdating” scandal,” and they gripe about “duff gadgets,” whatever the hell that means. Why can’t you friggin Brits speak English for God’s sake? Anyway the killer quote of the piece comes at the end: “For the moment at least it is hard to think of a large company that better epitomises the art of innovation than Apple.” Minus 2 points for misspelling “epitomize” but otherwise, yes, you’re spot on.